Greystone College Career Fair was held at Greystone College’s Downtown Vancouver Campus on October 28, 2016. Imagine having to meet your future employers under one roof in the convenience of your familiar campus surroundings. 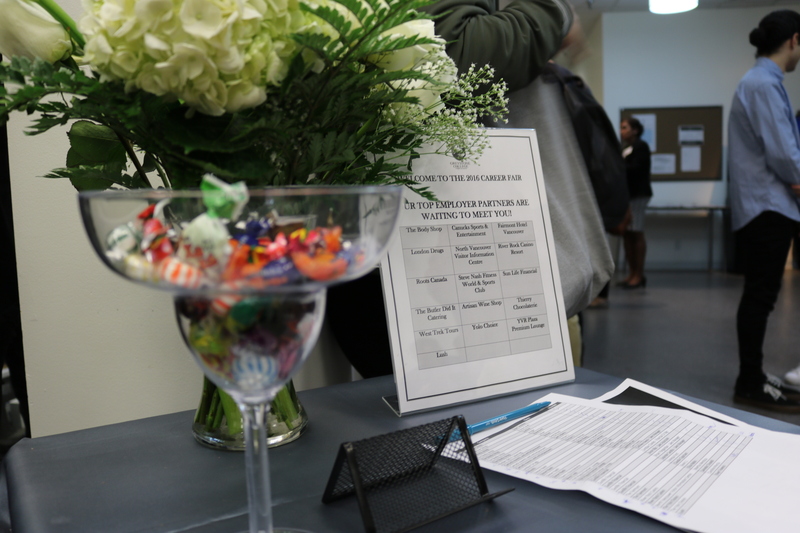 October 28th was the day the Greystone campus transformed into an exhibition hall for employers eager to meet qualified students and select candidates for open positions at their companies. The entire campus was abuzz with excitement and activity, with close to 300 students and 14 employer groups interacting, exchanging resumes, and conducting mini on-the-spot interviews. Amongst the employers were several long-term industry partners of Greystone College such as Canucks Events and Entertainment, West Trek Tours, Steve Nash Fitness World, The Fairmont, Roots, and Thierry Chocolaterie. While for many others like the YVR Plaza Premium Lounge, The Body Shop, River Rock Casino Resort, Lush, Artisan Wine Shop, Butler Did It Catering, The Yolo Choice, and SunLife Financial, this was their debut exposure to the quality offerings at Greystone College. 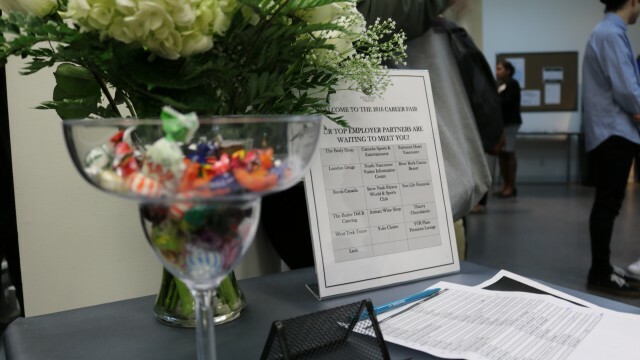 As for the students who came prepared to meet their future employers with perfected resumes, confidence, and professionalism, their efforts paid off. All the employers not only accepted their resumes, but also promised to contact them for further interviews. One such student was Eduardo Contreras from Mexico, who beamed with pride when he said: “Most of the companies here have my resume. I am really confident now that I will have a job here”. Career fairs are invaluable for both job seekers and employers. They are an excellent opportunity for employers to connect with many potential candidates at once, but they also give the job seeker an opportunity to show their personality rather than being judged on their resume alone. Most employers received roughly 40 resumes, with the intention of calling many of them back. The co-op team is currently talking with employers to see how many of the attendees will be joining their teams. For students who did not attend this fair, there will be another opportunity for you in the new year. Check out this link to see how you can be ready for future career fairs. Interested in taking a Co-op program at Greystone College? Greystone offers Co-op programs in and provides all the support for you to be job-ready.